Whether you're listing your condo for sale in Miami, FL, or looking for a buyer for your home for sale in Chicago, IL, the easiest way to find what needs a little attention is to "put your buyer's hat on and walk through your home like it is the first time." While small upgrades and minor decor replacements may seem like a waste of time when you're in a hurry to sell your house, one of the biggest mistakes you can make as a seller is listing your home without any advance preparation. Whether you're listing your condo for sale in Miami, FL, or looking for a buyer for your home for sale in Chicago, IL, the easiest way to find what needs a little attention is to "put your buyer's hat on and walk through your home like it is the first time," says Marilou Young, an Accredited Staging Professional and an associate broker with Virtual Properties Realty in the metropolitan Atlanta, GA, area. "Make notes on what you, as a buyer, would notice," Young advises, "and then repair or replace those items." to imagine hanging that "For Sale" sign out front. Clean, clean, clean. Be sure to clean every nook and cranny. Don't forget overlooked areas, such as dusting the fireplace mantel and ceiling fan blades, polishing appliances and faucets, and washing the windows. If you've already moved out or if you're too busy to do a thorough cleaning, consider hiring a cleaning service. Pay attention to smells. "Don't cook bacon in your home the day of a showing," advises Rachel Weinberg, a broker at Wright Kingdom Real Estate in Boulder, CO. "Although it might taste great, the smell is strong and lingers for a long time. You don't want your home to smell like a fast-food restaurant!" Clear out the clutter. You want buyers to focus on how awesome your space is, not how messy it looks. Banish that pile of shoes from the entry, that stack of mail from the kitchen table, and anything else that detracts from your home's gorgeous features. Repaint the walls in neutral colors. As much as you love your dramatic red dining room, it could turn off a good portion of your potential buyers. So repaint your rooms in neutral tones such as grays, tans, and whites that allow buyers to focus on the spaces, not the color of the walls. Keep the decor simple. To help buyers imagine themselves in your space, get rid of any statement art or decor that might turn people off. A classic landscape painting? Totally fine. Your zebra-print leather couch? Might want to slip-cover that for showings or rent a storage unit until you're ready to move it into your new place. Get rid of personal items. Buyers want to be able to envision themselves in your home, so remove anything overly personal, such as the gallery wall of family photos or your kids' artwork on the fridge. Let there be light! Open all the windows (especially in warmer months) to let in natural light and add floor or table lamps to illuminate areas that are dim. A bright, cheery room looks bigger and more inviting. Bring nature inside. Potted plants or a few pretty buds in a vase can help bring energy into a space, fill in empty corners, and even draw attention to features you want buyers to notice. Just make sure the plants are in good health (and bug-free!). Get rid of bulky furniture. Your furniture should fit the scale of the room, so get rid of any extra or oversized items that could make your space look smaller than it really is. For example, if you have a huge sectional in your family room, consider breaking it up and use just the main sofa portion. Organize your closets. Storage space is a huge selling point, and if your closets are stuffed to the brim, buyers will think you don't have enough of it. Invest in some boxes, dividers, and other solutions that will help you organize your space, and remove items you don't need (you can stow them away until you move). Tackle that honey-do list. All those little things you've been meaning to do but never got around to? Do them. 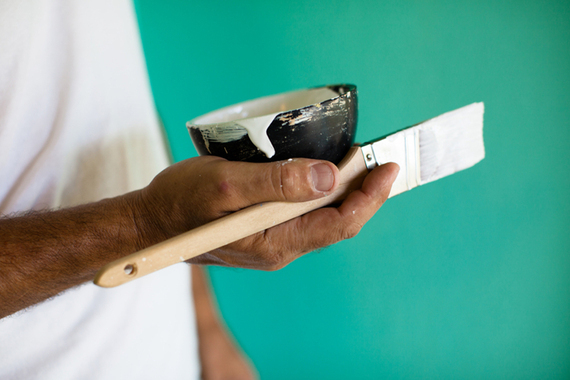 Buyers will notice minor flaws, and they'll detract from the value of your home. So set aside a weekend to tighten those loose doorknobs, fix that leaky faucet, and paint over the scuffs from when you first moved in your sofa. Do a faux renovation. Little tweaks can make a big difference in the overall feel of a room. Kitchen a bit outdated? Replace the fixtures, faucets, and hinges. Family-room furniture beaten up? Throw some slipcovers over it. Give each room a purpose. That spare room you've been using as an office/guest room/dumping ground won't help sell your home unless you show buyers how they can use it themselves. So pick a use (office, guest room, crafts room) and clearly stage the space to showcase that purpose. Turn the bathroom into a spa. Create the feel of a relaxing, luxurious bath -- for less than $30. Stack a few pretty washcloths tied with ribbon, add some candles and orchids, and buy bathmats and towels in coordinating tones such as light green, blue, and white. Lower the toilet seat. When it comes to both showing and photographing your home, this little trick can make a surprising difference. Turn the living room into conversation central. Practice the art of feng shui: Help buyers picture themselves relaxing with family and guests by grouping your furniture into arrangements that inspire conversation. Keep the flow going. The last thing you want is people bumping into furniture as they tour your home; it disrupts their focus and makes your space look cramped. Do a dry run as though you're seeing your home for the first time and tweak anything that interrupts the "flow." Make something yummy. Real estate agents don't put out fresh cookies at open houses just to treat buyers. A "homey" smell such as cookies or muffins baking can help people connect with a kitchen. Not a baker? Fake it with a scented candle. Make it look lived in with vignettes. Help your buyers see themselves in your home by adding deliberate vignettes that showcase how your home can be lived in. An inviting armchair and a tray with a coffee cup and book on it can turn that empty corner into a reading nook. Pretty soaps in a decorative tray can make your tiny half bath more appealing. Highlight focal points. Draw buyers' eyes toward any special features with bright colors or accents such as plants. A pop of red from a throw pillow can draw buyers' attention to that lovely window seat. A striking fern on the mantel can show off your fireplace. Boost the curb appeal. Don't spend all your time indoors. Buyers may decide to not enter a home based on its curb appeal, so make sure your home's exterior looks excellent. Trim shrubs, weed flower beds, remove and refresh any peeling paint, and keep the walkway clear. Just adding a row of potted plants along the walkway or a cheerful wreath to your front door can make a big difference. Marilou Young recommends her clients focus on curb appeal first. If her clients are on a tight budget, she'll advise that they at least spruce up the front entrance. That first impression goes a long way. How have you prepped your home for sale? Share your tips in the comments below!